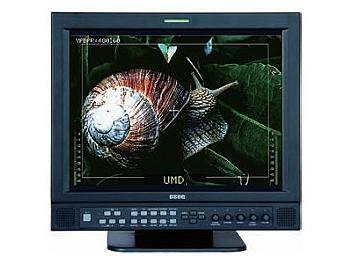 The LM150 is an affordable 15 " LCD monitor that can be used for multi-format standard definition video and audio monitoring. It has various On-Screen Display features and can display audio meter and UMD on the LCD panel. The LM150 provides cost-effective "all-in-one" solutions, and saves precious space when used for large Video Wall. The LM150 is equipped with 1024X768 high resolution panel and advanced digital video processing technology, and its high display quality is ensured by precise 3D de-interlacing, scaling and Gamma correction. It can accept all standard definition video signasl as well as VGA or DVI PC signal.